Combining the rustic beauty of old recycled glass beads with the elegance of white pearls, the SUNDARA HĀRA necklace is a unique beauty for the woman who adores handmade ethnic jewelry. The one of a kind necklace features old Nepali Sherpa red orange glass rondelles with gleaming pewter floral bead caps. The glowing semi baroque white pearls are an eye catching juxtaposition to the Sherpa beads. These smoky quartz stones are a lovely shade of brown and the topaz and green crystals give these stones a lovely complement of color. Smoky Quartz 10mm faceted round gemstones accented with Swarovski Round Crystals in a two-tone color of Fern/Topaz. Strung with nylon braided beading cord. Hand knotted between each bead with dark green cord. Smoky quartz is a grey, to brown translucent variety of quartz. 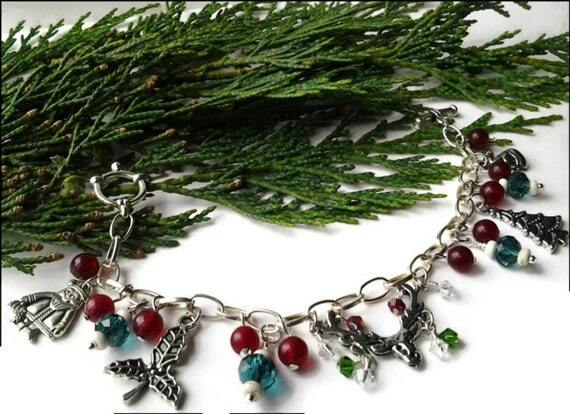 Red Candy Jade, Red, Green and Clear Swarovski Crystal, Pewter Charms Christmas Bracelet. Are you looking for the perfect Christmas accessory? This whimsical bracelet full of elegance and charm should check off that box for you. The center focal pewter charm is an enchanting reindeer; sparkling Swarovski crystals in the colours of red, green and clear dangle sweetly from the antlers of the reindeer. The base of this charm bracelet is a silver plated link bracelet. Etched opaque light red handmade glass lampwork beads wrapped in fine silver with a matte bead finish. 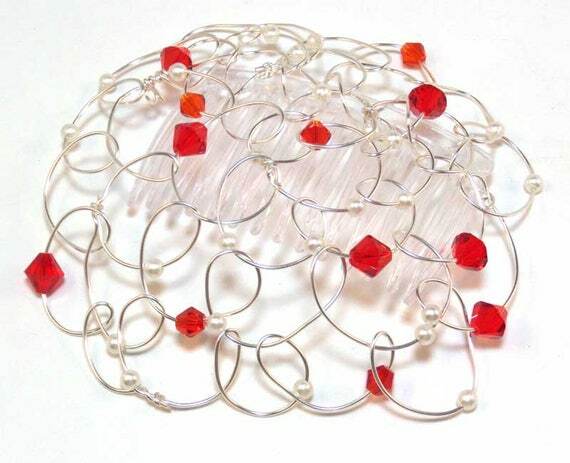 Beautiful bright red beads hand made using opaque light red glass. These light reddish orange romantic beads make a statement and stand out in the crowd. This is a giclee print on acid free fine art paper using archival inks. Enjoy the rich colors of the Christmas holidays within this elegant Czech superduo beadwoven cuff style bracelet. To infuse the holiday traditional colors I selected emerald green Czech superduo glass beads to run down the center. For the outer edges I selected ruby red Czech superduo glass beads. Running along the outer edge I used Miyuki Japanese galvanized gold glass seed beads to add a richer look to the bracelet. On each end I created loops using TOHO gold glass seed beads. For the closure I chose a gold plated trigger clasp. Both the chain and the trigger clasp are connected using high quality 24k gold plated snapeez jump rings by Via Murano. Womens Kippah - Bat Mitzvah Kippah Kippot Headcovering Chapel Cap- Silver and Red Swarovski Crystals 4"
These Vikings-inspired boho earrings feature shiny warrior shield charms, rainforest jasper drops, and rustic bone rondelle spacer beads. 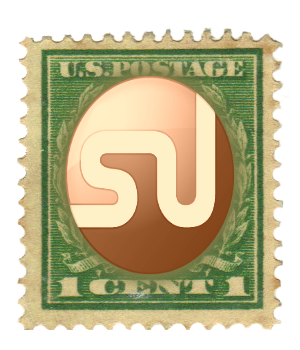 The shield charms were made in the USA of lead-free pewter, and they have an ornate granulation design with a boss on the front. 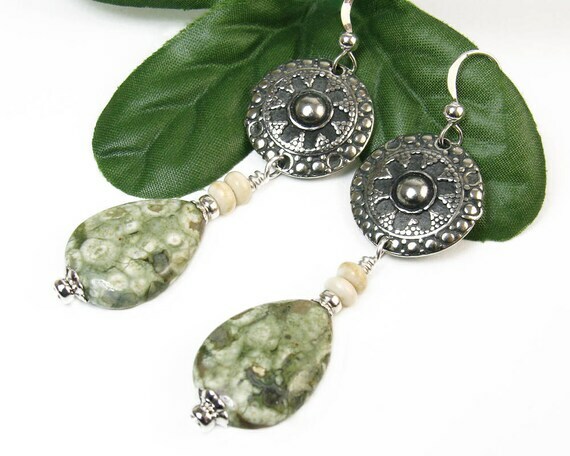 The rainforest jasper drops are tear-shaped and have a green variegated pattern with natural nodules and hints of quartz. The bone spacers are a rustic off-white, with areas of light brown. I like the extra tribal quality that they add to this special pair. Miami fans might recognize these orange and green swirled heart earrings with 4mm matching Swarovski crystal bicones are mounted on goldtone leverback earwires. Each bead is handmade. They are around 1-inch long. Ho, ho, ho! Santa Claus padded cases are unique stocking stuffers, perfect for holding small gifts, jewelry, candy, money or gift cards. Hang one on your tree for two gifts in one! 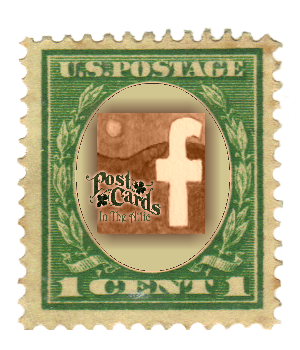 Great gift idea for Secret Santa gift exchanges and grab bags! They are re-usable and re-giftable! 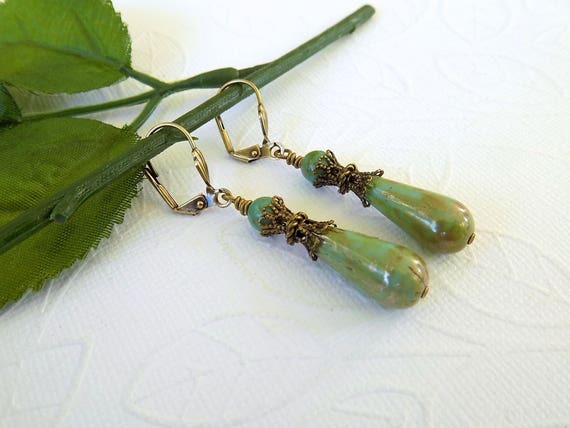 What a gorgeous pair of Czech glass teardrop earrings for the Fall and Winter Season. 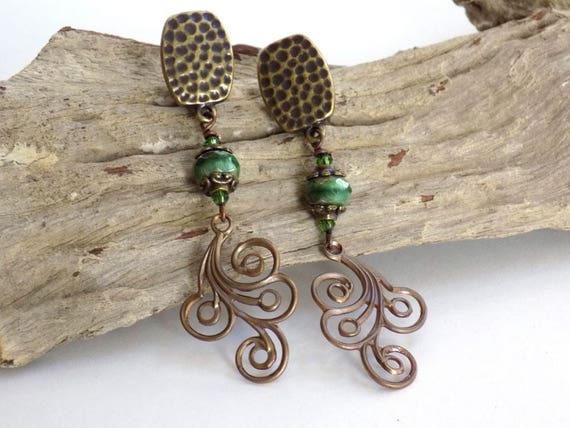 A lovely pair of earrings to wear back to school or to the office. Do you want a piece of jewelry that screams autumn? This is the bracelet for you! I made this beautiful bracelet with faceted round honey beads, green Rocaille beads and red Miyuki beads, a gold toggle clasp and FireLine. The red seed beads look bright orange next to the honey faceted beads giving this bracelet its vibrant spark. This bracelet is 8 inches long and ¼ inches wide. 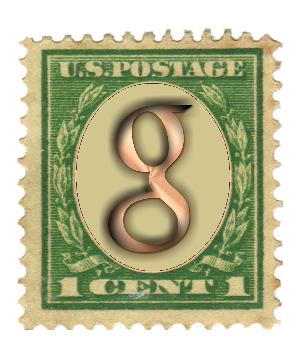 The inside circumference is about 7 ¼ inches. If your wrist is about 6.5 inches then this bracelet will fit you loosely. If your wrist is 7 inches then this bracelet will fit but it will be snug. 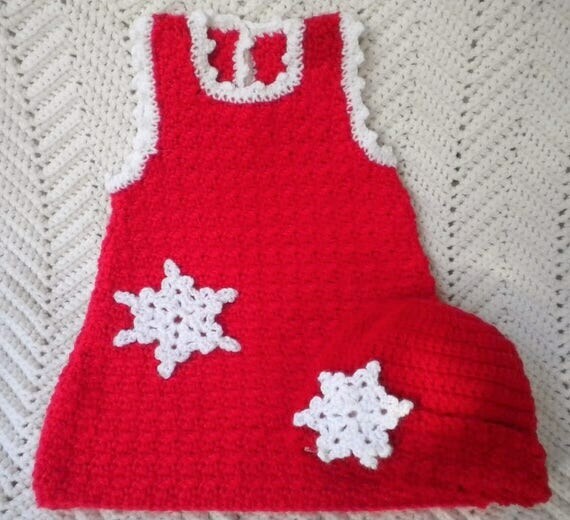 Perfect for your little Baby Girl to wear during the Christmas Holidays or Winter Months. This Hand Crocheted Jumper is sized 12 mo; and was crocheted using Plymouth DreamBaby Yarn in Red. The Trim around the collar and sleeves were crocheted using a Picot Lace Stitch with Bernat's Baby Soft Yarn in White. The Snowflake applique's on the Jumper and Hat are also hand crocheted. The Jumper closes with a tiny Pearlized Button in White. The little Jumper would also look perfect with a little "onsie" underneath. 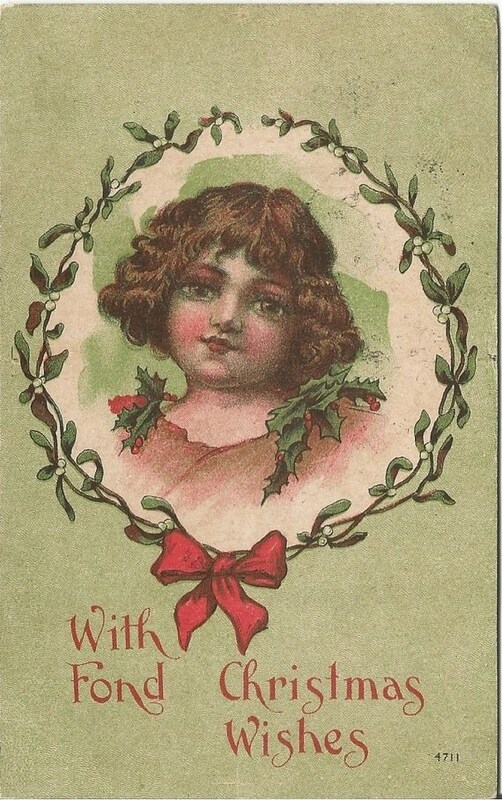 Beautiful green vintage postcard with a portrait of a little girl (looks Irish because of all the green) encircled by a wreath of mistletoe tied at the bottom with a red bow. 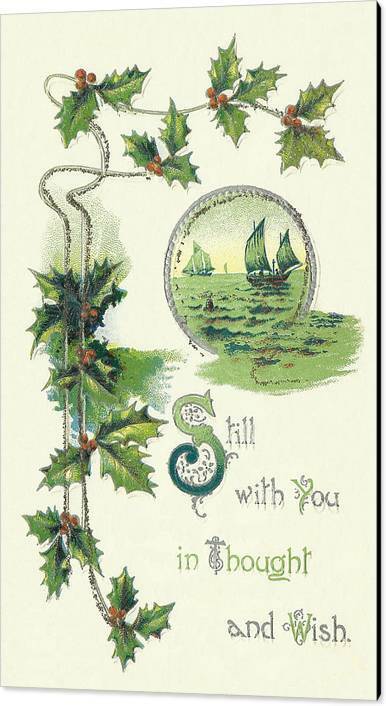 Place/Subject/Quote: From Front: "With Fond Christmas Wishes"
Christmas is the season to be jolly! How fun these Christmas tags are! 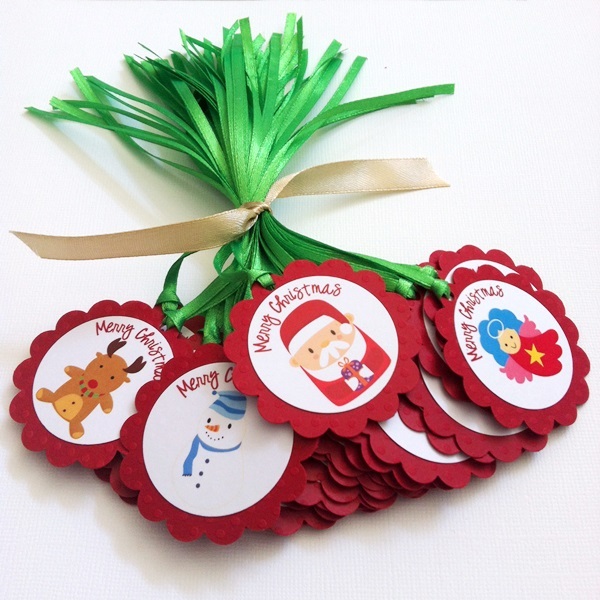 In each set of this listing, you will receive 12 (twelve) Santa Snowman Merry Christmas Gift Tags, pre-strung with ribbon for your convenience. All you need to do is tie them to your thoughtful and wonderful wrapped gifts. Add this cute tag as a final touch. These are one of a kind Christmas tags with 4 (four) different cute images included in a set. There are Santa Claus, Snowman, Angel, and Rudolph graphics. Each tag has Merry Christmas phrase on the top. 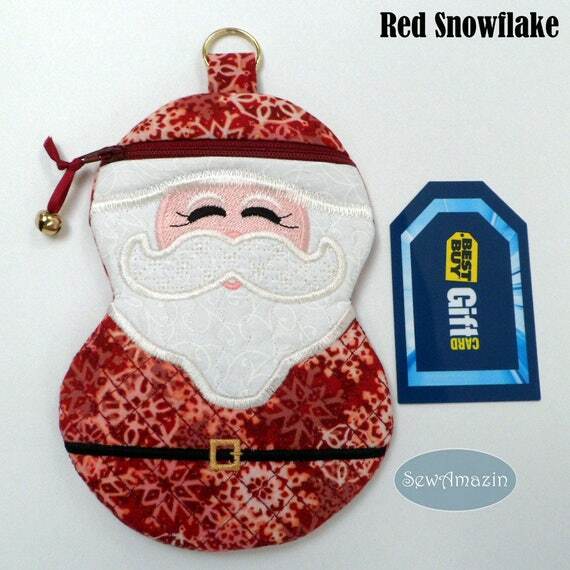 You will not get these adorable Holiday gift tags anywhere else. These certainly would make your gifts extra special! Each tag is measured about 2 inch (5.08cm) in a scalloped circle shape. 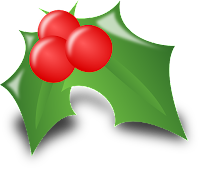 Always love reading about the plants associated with Christmas. Fascinating read about holly, Colleen. 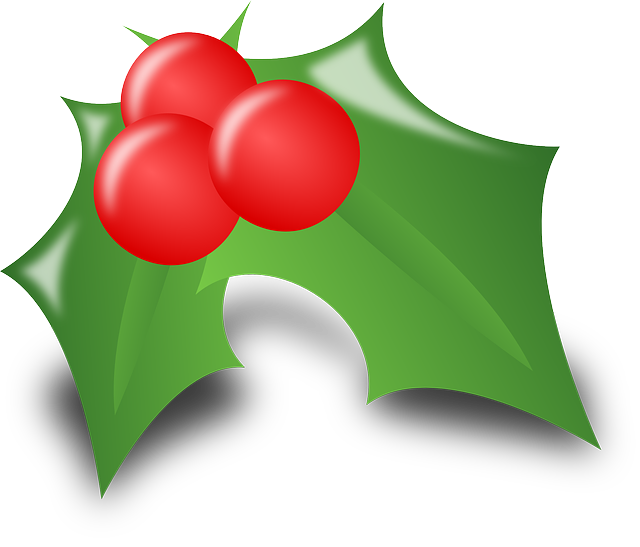 Also so many beauties are shared here - perfect representations of the red green and red of holly! Many thanks for including my Sherpa bead necklace. Will share the post and each item. Interesting to see the hollies. Jolly collection of handmade items. Thanks for including my red kippah. 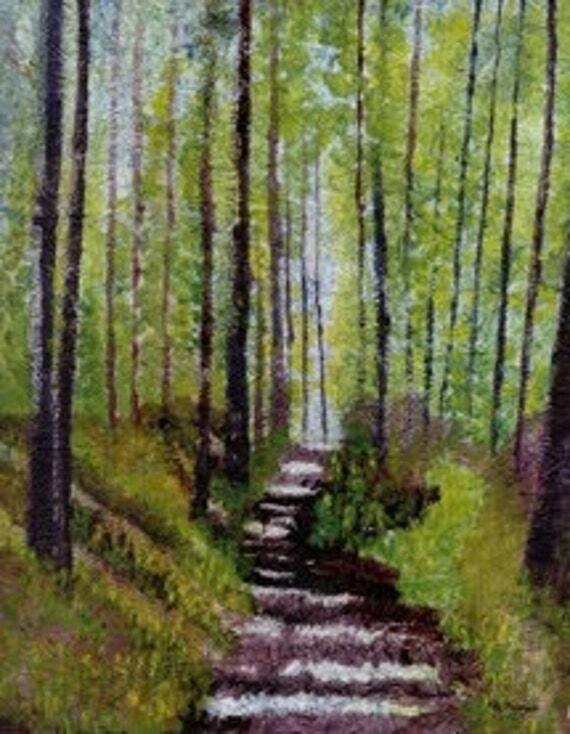 Thank you, Colleen, for including my painting. 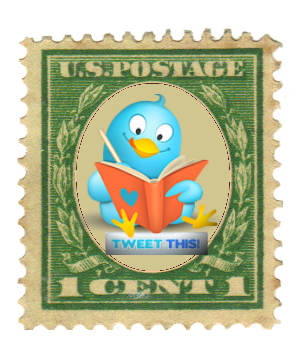 Pinned and tweeted all items. Thank you, Colleen! 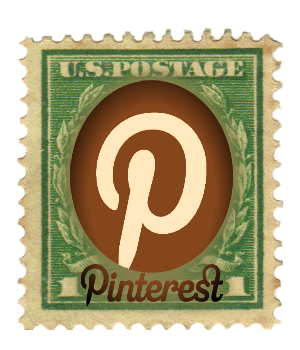 I enjoyed seeing all the beautiful red and green creations and sharing them on Pinterest and Twitter. Thank you for including my seed bead earrings! Thank you for including my smokey quartz necklace. Will share! Thank you very much Colleen for this extra promotion of all of us in the Christmas Countdown. I really appreciate all of your hard work. 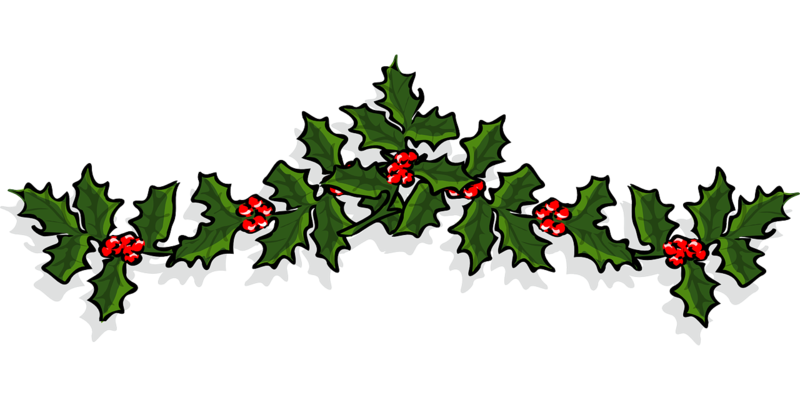 Enjoyed reading about the holly as well! Great selections, Colleen. Thank you so much for including my bracelet. Shared all. Thanks so much for including my Santa Claus cases in this week's post. 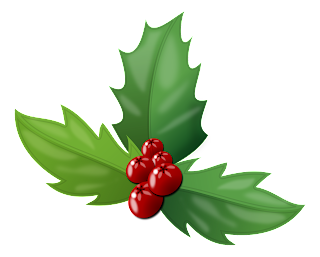 We have holly bushes in our yard and they are quite prolific! The birds love the berries. Fabulous collection Colleen. Thank you for including my earrings. Will be sharing.